We use our relationship for ongoing mutual learning, healing, growing, and awakening towards the capacity to love unconditionally. Learning about the world, yourself and your partner by staying curious, open and vulnerable keeps you engaged in your love relationship, with others, and with living your purpose. If we want to “think global and act local” in our complex world, information (there are tomatoes), knowledge (tomatoes are fruits) and wisdom (tomatoes usually don’t go into fruit salad) are crucial to making the best choices in our love relationships, our work and what we contribute to the world. The old adage “two minds/heads are better than one” holds true in most cases. Only together do we have 360 degree vision. Healing with your partner through shadow work or the powerful “Uncovering your False Identity” Process below (which we also practice in the Integral Relationship Workshops) allows you to own your emotional reaction to your partners reality, to develop compassion for your partners emotional reactions to your reality without feeling shamed or blamed, and to heal your underlying wounds. This practice is from the little known book Undefended Love (also reviewed in Integral Relationships: A Manual for Men page 192-193). It will quickly tell you if you have created a false identity and which of 21 common ones it is. If you do this with your partner, it is important to create a calm and safe space first, so that you don’t trigger each other during the exercise. State your complaint about your partner or ex-partner. Example: You are always creating distance between us. State your (emotional) reaction (usually a flight, fight or freeze reaction). Example: I feel angry and hurt. State the vulnerable feeling below your reaction. (This is a crucial step: It is important to authentically connect with the vulnerable feeling that is protected by the primary emotional reaction in step 2. Use the list of feelings versus interpretations from Integral Relationships: A Manual for Men page 35 – 38 to get in touch with and express an authentic feeling. Note that if you say “like” before the feeling, it is usually not a real feeling e.g. “I felt like running away” or “I felt like (s)he was unfair.” If it is too hard or painful to get in touch with the vulnerable feeling you may want to contact a trained licensed therapist for help, as the wound may be caused by deeper trauma that needs professional attention. Example: I feel sad and alone. State the belief underlying your vulnerable feeling. Example: Below the feeling of sadness I realize that I believe that you don’t care for me. Example: When I realize that I believe that you don’t care for me, I see that my deepest fear is that I am not worth loving. Example: I am unworthy (of love). Please contact me via email at martin@integralrelationship.com to receive your affirmation after you have uncovered your false identity, or if you have difficulty with the process. Note that different triggers in step one may lead to different falls identities. 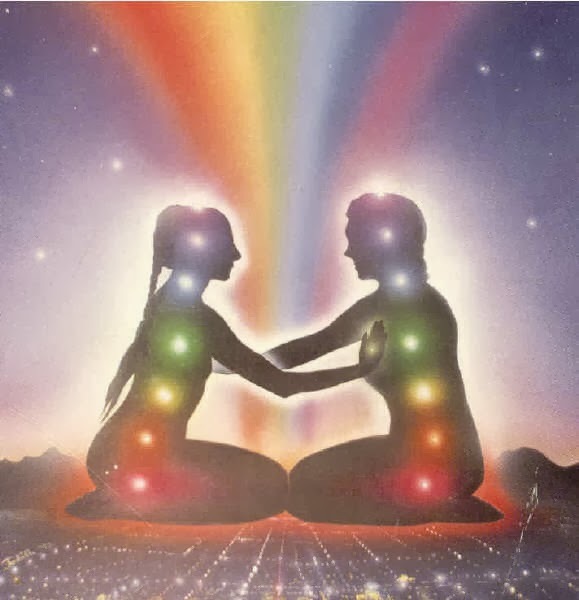 Growing through understanding the difference between (1) horizontal growth of better integration and (2) vertical growth of transformation in crucial developmental lines allows you to become better integrated and to co-create with your partner ever more fully at all levels of her/his being. With growth we generally mean the ability to take an increasing amount of perspectives; from “me” to “we”, to “us” to “all of us” to “all of it”. Or in integral language from archaic, magic, egocentric, conformist, rational, pluralistic, to integral and beyond (see Evolution Of Relationships) and Integral Relationships: A Manual for Men page 42-51. Growth happens when we start questioning our (limited) identification with particular world-views through differentiation and then integrate the world-view at the next higher level. In this process, not all limited views are transcended and not all basic/healthy capacities are integrated. Ken Wilber likens this to climbing a ladder. Each rung of the ladder represents a world-view with its basic capacities that are developed and integrated at this particular level, and the limited view of that level. As Roger Walsh mentioned above, love relationships and marriage are the most effective ways to uncover limited views and incomplete integration, as these get exposed when conflicts emerge in one or more of the four quadrants. See pages 125 -128 in Integral Relationships: A Manual for Men “Errors along the way” and “Ladder, Climber, View.” Again, feel free to contact me at martin@integralrelationship.com if you sense that limited views or missing integration at certain levels cause conflicts in your love life. Awakening to ever deeper levels of spiritual realization through a subject object meditation/mindfulness practice reduces fear and shame and deepen intimacy in your relationship. Many relationship problems arise through the fear-shame dynamic (which I will write a blog about soon). A meditation or mindfulness practice that brings awareness to the fact that we have, but are not defined through our material possessions, physical bodies, mental thoughts, feelings (such as fear or shame), and (spiritual or other) experiences, helps us to step back and stop the fear-shame dynamic. In our Integral Relationship Workshops we do a guided partnered meditation that guides you through these state-stages. They are also described in Integral Relationships: A Manual for Men pages 51-55. Loving unconditionally by differentiating localized devotional “love” from unconditional evolutionary “Love” allows you to deepen your commitment to your partner in a safe container. Many people want to love and be loved unconditionally. But, as Eckhart Tolle said, “the ego cannot love, it always wants something”. Being integrally informed allows us to understand the difference between healthy Ego development (aka growing up) and spiritual awakening (aka waking up), as described in the Wilber-Combs Lattice. So even though we say that first-tier relationships are need based and second-tier relationships are being based, we always have needs and wants in love relationships… point in case … to be met at our level so that we can continue to learn, heal, grow, awaken and share a purpose with our partner (let alone material, physical, sexual, emotional and intellectual needs that we all have and who are not transcended in second tier … we may just project them less on our partner). We may call the love we experience for a partner who meets our needs and wants localized devotional, sacred, or evolutionary love. This is different from unconditional love which we can only experience through a spiritual practice that eventually transcends all duality and makes us “one with everything” or what Ken Wilber calls “One Taste”. This “One Taste” then includes of course our partner, just as it includes everything else. Ken Wilber responded to the question if it is possible to evolve beyond the need to be in a romantic relationship. Thank you for leaving your comments below and for sharing this blog on your facebook page.